On Thursday 25th September I was about to set off from Shepherd’s Crag near Keswick, under the gaze of Little Chamonix. It was a beautiful morning. Heading for Skipton 85 miles away, I was planning to ride the reverse of my In The Frame, a journey from the lowest to highest. I had the idea last year to do this trip. It was met with the usual disbelief, perhaps because I wanted to do this alone, perhaps because I wanted to do something so far beyond my scope of possibility AGAIN! I got so stressed this year, a year that started with a spell in a wheelchair once more. During the year I suffered more loss, a pain I couldn’t deal cope with well. Throughout all that I hung on to the idea of this epic thousand mile journey. It was as if the Little/ Big Chamonix thing was a thread I just couldn’t help but pull. Try as I might to ignore it, it was there tantalising me every time the matter of ‘what’s next’ come up in a conversation. I’d find myself halfway through talking about before I’d realise and retract it, dismissing it as ridiculous. So much time on my own. So much time on a bike. So many miles and for what? And now, I was there, at the Shepherd’s Cafe overshadowed by the imposing rock in which Little Chamonix stands. In the days before I had packed up my things and put them in storage. This was to be a trip that coincided with many changes. I was homeless for one thing. A cold frosty morning seemed to mark the beginning of Autumn, and for this trip there was no big send off even though I felt like I was bidding farewell to the climber I was, a farewell to many things but the start of new things too. Who knows what would happen when you allow the randomness of life to take over? I’d been trapped for so long bound by the cycle of surgery, recovery, challenge, surgery, recovery … I felt that if i could complete the thousand miles from Little Chamonix to Chamonix in France it would be the first time that I’d have completed something so spectacular with no threat of surgery afterwards, not for a long time anyway, the first challenge without seeping wounds too! So I set off on that cold Thursday morning, saying goodbye to my friend, and saying goodbye to the life I once knew so well. I’d done this part of the route before but this time I wasn’t headed home. I would pass home and ride more miles back to back than I’d ever done. Fuelled by an espresso I headed via Kendal, soon to be joined by my friend Mark, manager of Kendal Climbing wall and chief bike-related motivator. It wasn’t long until the heavens opened. Mark wasn’t with me for long, and I continued to ride with my head down shielding the rain, solemn thoughts haunting me, the sheer magnitude of what I had started hitting home. ‘What if it rains the entire way?’ I wondered. I hadn’t looked at weather reports. But I reassured myself that I didn’t need to know what was coming: I can’t change the weather so I wouldn’t moan about it, I’d just deal with whatever nature threw at me. The miles slipped by. I’d been riding on the same route as I did during In The Frame since I left Ambleside. In reverse. The memories that I thought I’d forgotten would appear with each new road. I suffer from an incredibly short memory, but this visual aide memoire meant everything came flooding back was so powerful. I’d stop occasionally and bask in the warmth of memory. I’d shed a tear when I think to how painful my life was back then. I’m lucky to be alive. I’m lucky to be mostly happy. I’m lucky to be surrounded by inspirational and motivated folk. 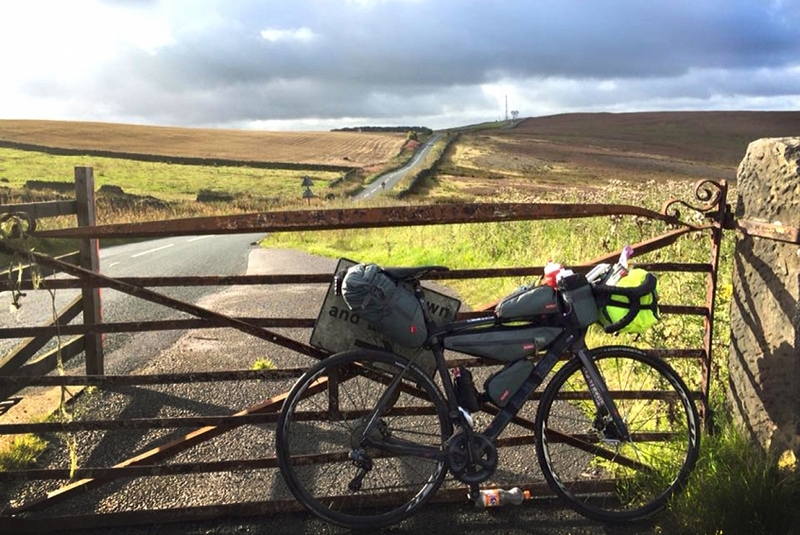 Day 2: Skipton to Alpkit Big Shakeout – 85 miles. I woke after a full 12 hours of sleep. A night in a hotel was not the adventure I had planned. I felt like fraud, barely had I started the adventure and I had a doley blackout – my term used to describe sleeping till mid afternoon. I thought about this, but rationalised, this is my adventure and I only have my conscience to contend with. It may sound perverted but I have to admit I like hills. I like being able to keep pushing myself, but this bike was heavy once I’d packed it with the luggage that I needed to be self-sufficient on this journey. And even with that extra effort, I found that the hills make me think more. Riding uphill intensifies the silent dialogue that shouts ‘you’re stronger than you think, shut up legs shut up brain,dig deep, the top will come if you continue, remember the elation’. As I neared Bakewell and the festival, I eased up on myself and I think I forgot to enjoy myself. I was enduring myself instead. Hours had slipped by but I don’t remember enjoying them: I reminded myself not to let that part of the ride slip. As I rode down the last little hill, I knew I was nearly there. A beer and friends were waiting for me. A smile crossed my face, I remember this road! This is where Sophie and Matt live! I had only been there once before, but Sophie, or Dr Payne as I liked to call her, had appeared In The Frame as our a voice of professional reason. Perhaps I should pop in unannounced? I hadn’t seen them since the recording. Sophie’s coffee was the best I’d tasted for days and I was so please I remembered enjoy myself and spend time with spontaneity.